You get a phone call in the middle of the night. The new sysadmin (whom you hired straight out of college) is flipping all of her shits because web app performance has degraded beyond the alert threshold. She’s been clicking through page after page of graphs, checking application logs all the way up and down the stack, and just generally cussing up a storm because she can’t find the source of the issue. You open your laptop, navigate straight to overall performance graphs, drill down to database graphs, see a pattern that looks like mutex contention, log in to the database, find the offending queries, and report them to the on-call dev. You do all this in a matter of minutes. Why is it so hard for experts to understand the novice experience? Well, in his book Sources of Power, decision-making researcher Gary Klein presents some really interesting theories about what makes experts experts. His theories give us insight into the communication barriers between novices and experts, which can make us better teachers and better learners. the ability to imagine people and objects consciously and to transform those people and objects through several transitions, finally picturing them in a different way than at the start. 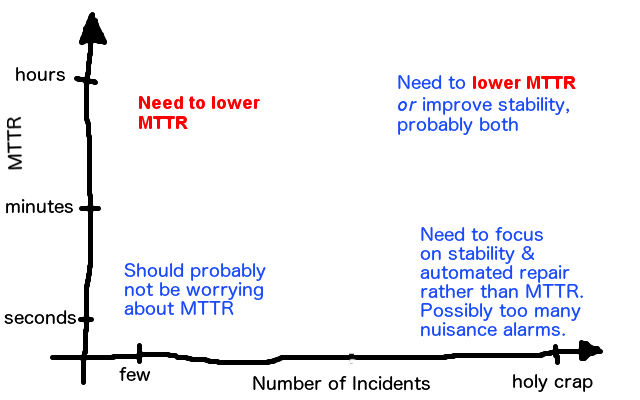 Klein has never studied sysadmins, but when I read about his model I recognized it immediately. This is what we do when we’re trying to reason out how a problem got started, and it’s also how we figure out how to fix it. In our head, we have a model of the system in which the problem lives. 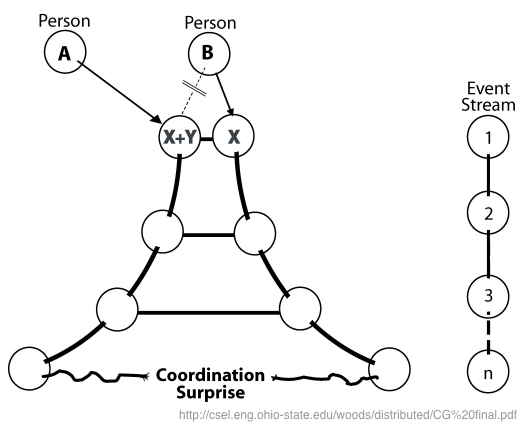 Our model consists of some set of moving parts that go through transitions from one state to another. If you and your friend are trying to figure out how to get a couch around a corner in your stairwell, your moving parts are the couch, your body, and your friend’s body. If you’re trying to figure out how a database table got corrupted, your moving parts might be the web app, the database’s storage engine, and the file system buffer. You envision a series of transitions from one state to the next. If those transitions don’t get you from the initial state to the final state then you tweak your simulation and try again until you get a solution. That’s about all we get, regardless of our experience or intelligence. So how do experts mentally simulate so much more effectively than novices? As we gain experience in a domain, we start to see how the pieces fit together. As we notice more and more causal patterns, we build a mental bank of abstractions. An abstraction is a kind of abbreviation that stands in for a set of transitions or moving parts that usually functions as a whole. It’s like the keyboard of a piano: when the piano’s working correctly, we don’t have to think about the Rube Golberg-esque series of yanks and shoves going on inside it; we press a key, and the corresponding note comes out. Experts have access to a huge mental bank of abstractions. Novices don’t yet. This makes experts more efficient at creating mental simulations. Now if you recall that problem solving involves mental simulations with at most 3 moving parts and 6 transitions, you’ll see why abstractions are so critical to the making of an expert. Whereas a novice requires several transitions to represent a process, an expert might only need one. The right choice of abstraction allows the expert to hold a much richer simulation in mind, which improves their effectiveness in predicting outcomes and diagnosing problems. Klein highlights another important difference between experts and novices: experts can readily process counterfactuals: explanations and predictions that are inconsistent with the data. This is how experts are able to improvise in unexpected situations. Imagine that you’re troubleshooting a spate of improper 403 responses from a web app that you admin. You expect that the permissions on some cache directory got borked in the last deploy, so you log in to one of the web servers and tail the access log to see which requests in particular are generating 403s. But you can’t find a single log entry with a 403 error code! You refresh the app a few times in your browser, and sure enough you get a 403 response. But the log file still shows 200 after 200. What’s going on? Why are experts able to adjust so fluidly to counterfactuals while novices aren’t? It comes back to abstractions. When experts see something that doesn’t match expectations, they can easily recognize which abstraction is leaking. They understand what’s going on inside the piano, so when they expect a tink but hear a plunk, they can seamlessly jump to a lower level of abstraction and generate a new mental simulation that explains the discrepancy. Tell stories. When Gary Klein and his research team want to understand an expert’s thought process, they don’t use questionnaires or ask the expert to make a flow chart or anything artificial like that. The most effective way to get inside an expert’s thought process is to listen to their stories. So when you’re teaching a novice how to reason about a system, try thinking of an interesting and surprising troubleshooting experience you’ve had with that system before, and tell that story. Use the Socratic method. Novices need practice at juggling abstractions and digesting counterfactuals. When a novice is describing their mental model of a problem or a potential path forward, ask a hypothetical question or two and watch the gears turn. Questions like “You saw Q happen because of P, but what are some ways we could’ve gotten to Q without P?” or “You expect that changing A will have an effect on B, but what would it mean if you changed A and there was no effect on B?” will challenge the novice to bounce between different layers of abstraction like an expert does. Remember: your boss may be a novice. Take a moment to look around your org chart and find the nearest novice; it may be above you. Even if your boss used to do your job, they’re a manager now. They may be rusty at dealing with the abstractions you use every day. When your boss is asking for a situation report or an explanation for some decision you made, keep in mind the power of narratives and counterfactuals. You Know Who’s Smart? Friggin’ Doctors, Man. Inspired by Steve Bennett‘s talk at Velocity 2012 (slides here. I swear it’s a great talk; I didn’t just think he was smart because he’s British), I’ve been trying lately to apply medicine’s differential diagnosis approach to my ops problem solving. If you’ve ever seen an episode of “House M.D,” you’ll recognize the approach right away. Since my girlfriend (partner/common-law fiancée/non-Platonic ladyperson/whatever) is a veterinary student, I end up hearing a lot about medical reasoning. One of her classes in first year was “Problem-Based Learning,” or as I called it, “House D.V.M.”. The format of this class should sound familiar to anyone who’s worked in ops, or dev, or the middle bit of any Venn diagram thereof. You walk in on Monday and grab a worksheet. This worksheet describes the symptoms of some cat or pug or gila monster or headcrab that was recently treated in the hospital. Your homework: figure out what might be wrong with the animal, and recommend a course of treatment and testing. On Tuesday, you’re given worksheet number 2. It says what a real vet did, given Monday’s info, and then it lists the results of the tests that the vet ordered. So the process starts over: your homework is to infer from the test results what could be wrong with the animal, and then figure out what tests or treatments to administer next. This process repeats until Friday, by which point you’ve hopefully figured out what the hell. When I heard this, I thought it was all very cool. But I didn’t pick up on the parallels with my own work, which are staggering. And what really should have caught my attention, in retrospect, is that this was a course they were taking. They’re teaching a deductive process! Can We Formalize It? Yes We Can! In tech, our egos often impede learning. We’re smart and we’ve built a unique, intricate system that nobody else understands as well as we do. “Procedures” and “methodologies” disgust us: it’s just so enterprisey to imagine that any one framework could be applied to the novel, cutting-edge complexities we’re grokking with our enormous hacker brains. Give it a rest. Humans have been teaching each other how to troubleshoot esoteric problems in complex systems for friggin millennia. That’s what medicine is. Write down what you know: the symptoms. Brainstorm possible causes (“differentials”) for these symptoms. Figure out a test that will rule out (“falsify”) some of the differentials, and perform the test. If you end up falsifying all your differentials, then clearly you didn’t brainstorm hard enough. Revisit your assumptions and come up with more ideas. This simple process keeps you moving forward without getting lost in your own creativity. The brainstorming step of this deductive process (“writing down your differentials”) is critical. Write down whatever leaps to mind. Doctors have mnemonic devices to help cover all the bases here. One of the most popular is VINDICATE (Vascular/Inflammatory/Neoplastic/Degenerative/Idiopathic/Congenital/Autoimmune/ Traumatic/Endocrine). They go through this list and ask “Could it be something in this category?” The list covers all the systems in the body, so if the doctor seriously considers each of the letters, they’ll usually come up with the right differential (although they may not know it yet). Vets have a slightly different go-to mnemonic when listing differentials: DAMNIT. There are several different meanings for each letter, but the gist of it is Degenerative, Anomalous, Metabolic, Nutritional, Inflammatory, Traumatic. Besides being a mild oath (my second-favorite kind of oath), this device has the advantage of putting more focus on the trouble’s mode of operation, rather than its location. These mnemonics are super useful to doctors, and it’s not that hard to come up with your own version. Bennett suggests CASHWOUND (see his slides to find out why). No Seriously, Try It. It’s Great. 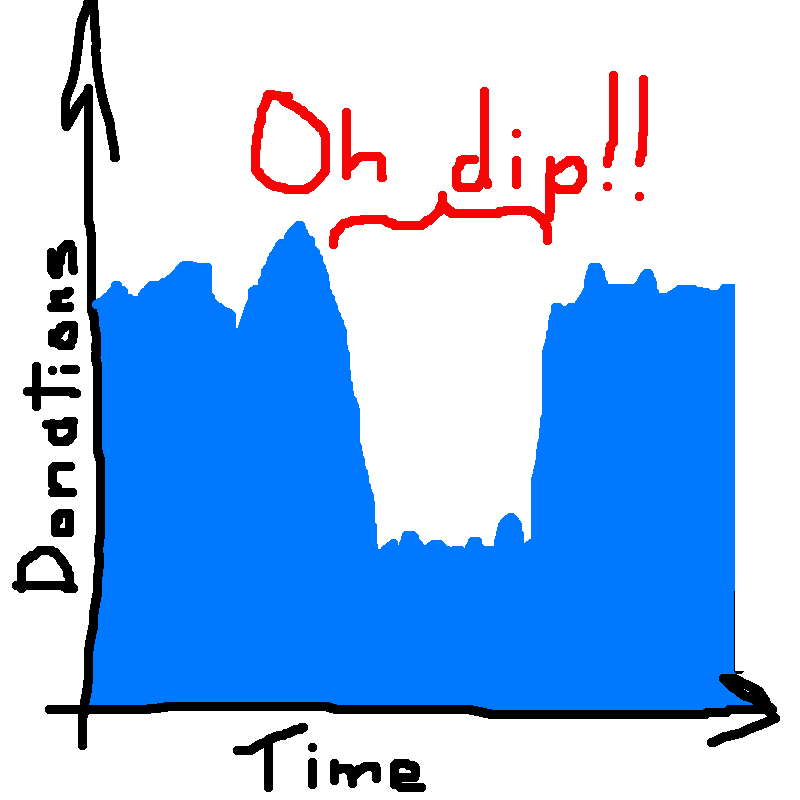 That dip in donations lasted about 10 minutes, and we found it extremely disturbing. So we piled into a conference room with a clean whiteboard, and we started writing down differentials. Admittedly this is not a very long list, and we could’ve brainstormed better. But anyway, we started trying to pick apart the hypotheses. We began with a prognostic approach. That means we judged hypothesis (B) to be the most terrifying, so we investigated it first. We checked out the web access logs and found that donation pages had been loading just fine for our users. Phew. (E) is pretty severe (if not particularly likely, since we hadn’t deployed the payment-processing code recently), so we investigated that next. 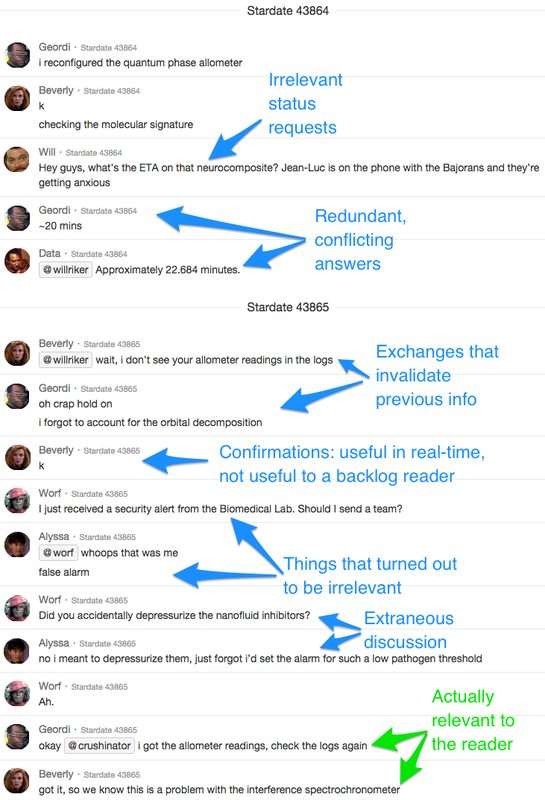 No joy — the application’s logs were clean. Next up was (A), but it proved false as well, since we found no errors or abnormal behavior in the firewall logs. Throughout this process, I found that the differential diagnosis technique helped focus the team. Nobody stepped on each other’s toes, we were constantly making progress, and nobody had the feeling of groping in the dark that one can get when one troubleshoots without a method. Try it out some time!